Golubtsy and vinaigrette remind Australians of… McDonald’s? A traditional Russian meal served Down Under brings the revelation that Australians may like beets even more than Russians. Having introduced my Australian in-laws to schi I thought it was time to take them further into the world of Russian cuisine. This time I made the staple golubtsy (cabbage rolls with beef and rice) and the beet-and-vegetable salad known as vinaigrette. Luckily for my in-laws and, in part, for me, it’s practically impossible to find sour cabbage in Sydney, so my vinaigrette was cabbage-free. I also didn’t follow the instructions on adding mayonnaise and just went for the vinegar-based sauce instead. I do have a fear that some day I will get too comfortable with cooking Russian cuisine and not notice that I have crossed the line into true Russianness – I think that line might be made of mayonnaise. I got my niece and nephew, Zahra and Hal, to help me roll the stuffed cabbage leaves – the same job my grandmother used to assign to my brother and me. I also put the kids on sauce duty. Hal later said that sauce was what added that “je ne sais quoi” to the meal. Although cooking with the kids made me feel like a grandmother, I thought it was great fun. Kids these days really aren’t that bad after all. By the time everything was ready, the family were all starving. Russian food takes much longer to prepare than the typical Aussie BBQ! I was very hopeful they would consider it worth the wait. Zahra said the food made her think of a McDonalds hamburger. That statement was promptly defended by her older brother who said that the food tasted much, much better than McDonalds. Big praise from a 15 year old boy. I was trying to understand what she meant and she elaborated it was the beet in the vinaigrette that made her think of the hamburger. Why a country that produces so much beautiful produce is so taken with a root vegetable will remain a mystery to me, but it certainly worked in my favor. Unlike my niece, at the age of 12 I hated vinaigrette. I blame McDonald’s for not putting beets on their hamburgers in Russia. My mother in law was quite taken with vinaigrette, too. She said she would serve it to her friends as a side to BBQ meat. It only then occurred to me then that it does make a perfect summer salad. I have wild hopes now that it will catch on in Australia, a country where almost any cuisine of the world is available, but Russian food is largely unknown. I was pleasantly surprised that golubtsy were well received, too. Although I don’t have wild hopes of them catching on in Australia. They are already available in Greek restaurants, and for now that might be good enough. Cut potatoes, apple, pickles, beet and carrot into cubes or strips. 4-5 boiled potatoes; 1 beet; 1 carrot; 2 pickles; 1 apple; 100 grams sauerkraut; 50 grams; green onions; 2-3 Tbsp vegetable oil; ½ cup vinegar; 1 tsp mustard; sugar to taste. Combine them in a bowl and add the sauerkraut. In a separate bowl, mix together mustard, salt, pepper, sugar, oil and vinegar until sugar dissolves. Pour the dressing over the vegetables and mix. 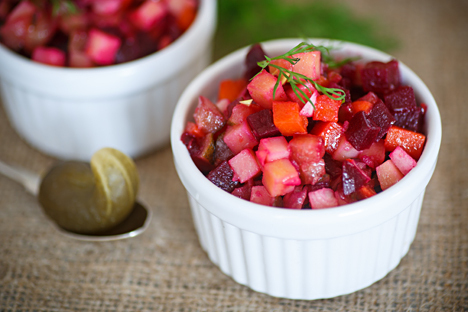 To serve, put in a salad bowl and garnish with slices of beets, sprinkle with green onions and dill. You can also decorate the salad with fresh cucumbers and tomatoes. Vinaigrette is a more delicious if made with the mayonnaise sauce. To make Mushroom Vinaigrette, add different pickled mushrooms - about 25 grams per serving. Cook rice. Cool and combine with ground meat. Chop and lightly fry the onion. Add the onion to the meat and rice mixture along with salt and pepper to taste. Boil some water. Add whole cabbage leaves and submerge them in the boiling water for 5-7 minutes, then remove them from the water and cool. When cool, pound the leaves until they are the thickness of a sheet. Put a portion of the meat and rice mixture in each leaf and wrap it up. Add butter to a pan and fry the rolls briefly. Then add the cream, tomato paste, 1 cup of water and flour, stirring until the flour is combined. Bring the mixture to a boil and add salt to taste. 300 grams of ground beef; 800 grams cabbage; 1/2 cup rice (millet or barley will also work); 1 onion; 1 Tbsp flour; 2 Tbsp tomato paste; 1 Tbsp cream; 1 Tbsp butter. Cover the pan and let the rolls simmer on low heat for 30 to 40 minutes. The rolls can also be baked on low heat in the oven for 30-40 minutes, but in this case, do not cover the pan. Serve the rolls with sauce sprinkled with dill or parsley. The stuffed cabbage can be prepared without cream, but in this case add more tomato paste.